Whatever it is, He's bigger. Courage isn't the absence of fear. It's choosing faith instead. But courage usually comes into our lives through hard choices. Will we choose what's easy or hard? Sacrifice or selfishness? Feelings or faith? The difference between courage and cowardice is found not in our own strength but in God's—and in our ability to trust Him. In these moments we decide whether we'll do what the Bible teaches, or go our own way. We'll find security in God's promise to always be with us. . . or look elsewhere. Families need to talk about courage, because we'll all have moments of difficulty that demand tough decisions. And courageous role models can take us to a place of faith. These true stories capture our attention, granting vision and worthy examples that will redefine courage for every age. 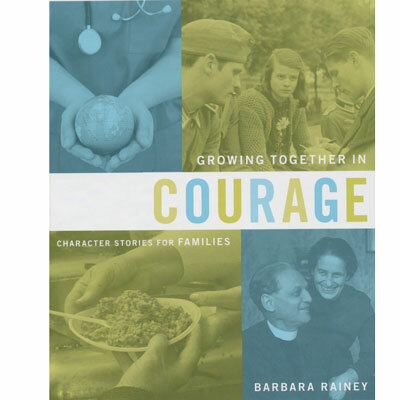 With captivating stories to read as a family, this seven-day interactive devotional from speaker and best-selling author Barbara Rainey saturates minds and hearts with memorable accounts and vivid illustrations of true heroes who made noble choices. Growing Together in Courage is part of The Character Stories for Families Series: Heart-changing history.